Read the descriptions below to determine whether you are required to submit an online Tree Ordinance Review Application (TORA), or a Residential New Construction and Addition Application. Once you determine your application requirements, scroll down to read frequently asked questions for Residential Tree Reviews and frequently asked questions for TORA. The tree permitting process for residential properties that meet the above criteria is consolidated with the Residential Plan Review application process, therefore submittal of an online Tree Ordinance Review Application is not required. How do I submit a Tree Ordinance Review Application (TORA)? Applications are submitted through our online system, Austin Build + Connect (AB+C). The online process can be used for all TORA submittals, except for requests associated with residential construction. Those requests must be submitted through the Residential Plan Review process and a separate TORA is not required. You will be required to create an account prior to submitting your online application. You may also pay applicable fees online and print your application. Click here for Instructions on how to submit an online application and pay applicable fees. What is the Tree Review timeline? Residential Tree Reviews follows the timeline schedule for residential Plan Review and ranges between 5 to 15 business days, depending on the application type. Is there a separate fee for the Tree Review? Yes, please refer to the fee schedule. Please note that a 4% Development Services Surcharge fee will be added to all permit fees. What if the tree is no where near the work being done? What if there are protected size trees on, or adjacent to the development, but the trees are not near the work site? Check "Yes" on your Plan Review Application and staff will determine if a Tree Review is required. Applicants may not realize the potential impacts such as work access, utility upgrades, canopy clearance, etc. that must be considered in proposed work anywhere near protected trees. If staff finds that the Tree Review is not needed, the review will be cancelled and the fee will be refunded. What if the tree is not dead or diseased? 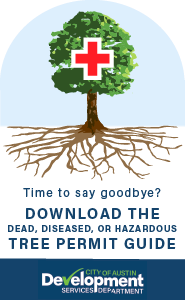 What if a tree does not meet the criteria of being dead, diseased, or an imminent hazard, but new construction is proposed and tree survival is questionable? In this case the Tree Reviewer will work with the applicant to find a viable solution. The applicant should provide photographic evidence of the tree in order to better assess the situation. What are the possible outcomes of a Tree Review? Approved- A Tree Permit will be created along with building permit. Conditions may apply and will be indicated on the tree permit. Rejected- Tree Review comments will be provided through the Master Comment Report generated by Residential Review. Review comments will detail what additional information or plan modifications are required. All updates must follow the Residential Plan Review process. Instructions are included with the Master Comment Reports. Review Not Required- No further action required. Is a Tree Inspection required? Yes, please click here for further information on how to schedule an inspection. How do I check the status of a review? Click here to view the status of active permits. What is the TORA timeline? How do I submit a TORA? TORAs are submitted online through Austin Build +Connect (AB+C) Web Portal. Download the instructions for online submittal and payment of applicable fees. Who do I contact for emergency tree removal permit?